Plant taxonomy classifies Caradonna salvia plants as Salvia nemorosa 'Caradonna.' The part in single quotation marks is the cultivar name. A common name for this flower is "meadow sage." In fact, it is in the same genus as common, or "culinary" sage (S. officinalis) so well known as an herb to foodies. The genus name derives from the Latin word salvere, meaning "to heal." Indeed, in addition to its use to flavor meals, common sage has been used medicinally (to improve memory, for example). Caradonna salvia plants are herbaceous perennials. Caradonna salvia plants reach about 2 feet in height, with a similar spread. However, foliage comprises only about 1 foot of that height: the rest is taken up by the exquisite flower spikes, which tower above the foliage. The small flowers that mass along the spikes are a deep, purplish-blue in color. The spikes are relatively narrow, giving them a delicate appearance. The plants exhibit a rigidly upright growing habit. And even the flower stems themselves are a deep purple, adding to the color display furnished by the flowers. Grow Caradonna salvia flowers in a location with full sun and with a well-drained soil. Although drought-tolerant once established, a moderate amount of water must be supplied to young plants. Salvia nemorosa is native to Eurasia. In North America, these perennial flowers are best grown in USDA plant hardiness zones 4 to 8. 'Bordeau Steel Blue': a lighter blue color (a shade of blue similar to that on 'Blue Hill'). ‘Schneehugel’ (Snow Hill): white blooms. ‘Rosenwein’ (‘Rose Wine’): pink flowers. If you deadhead Caradonna salvia flowers (that is, remove the spent blooms), the plants will flower all summer long. Fertilize the plants by working compost or manure tea into the soil. The flowers may be used in cut-flower arrangements, and the dried leaves are fragrant enough to warrant inclusion in potpourris. In the landscape, they make good edging plants, and their medium size makes them useful in the middle row of a layered flower bed. 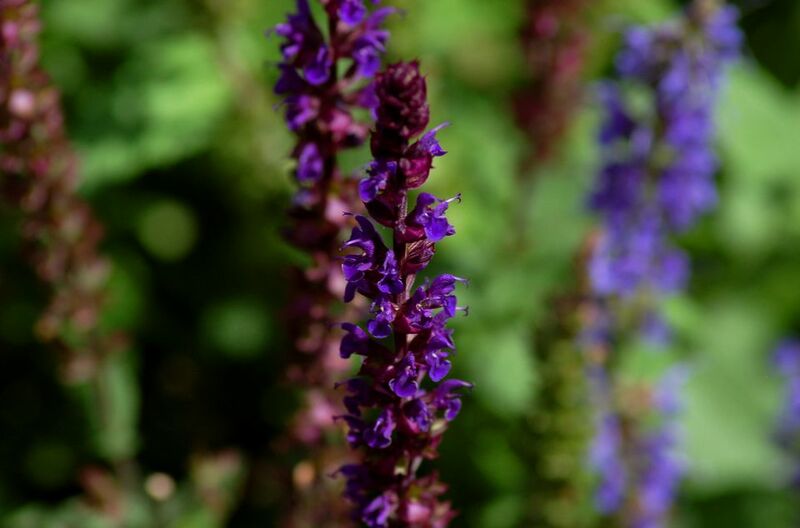 The rigidly upright growing habit, deep purple stems and delicate flower spikes all work together to give Caradonna salvia plants a striking appearance. Plants that attract butterflies, these perennials will also attract bees to your yard, thus promoting pollination in the garden. Happily, deer are not attracted to these deer-resistant perennials. Blue Hill: Top of the Heap for Light Blue Salvias?